Fred Pfaff, in his Arthur Pryor Band uniform, with his J.W. 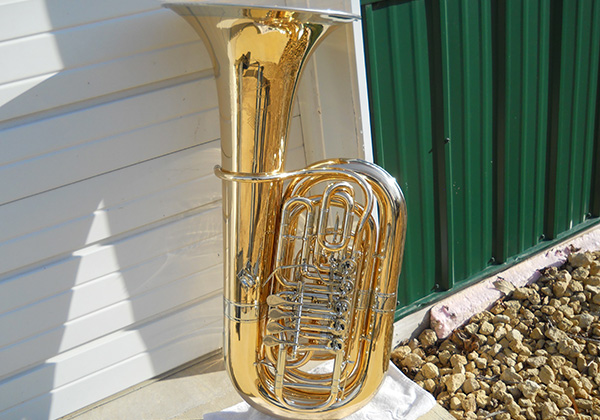 Richardson model Holton tuba. 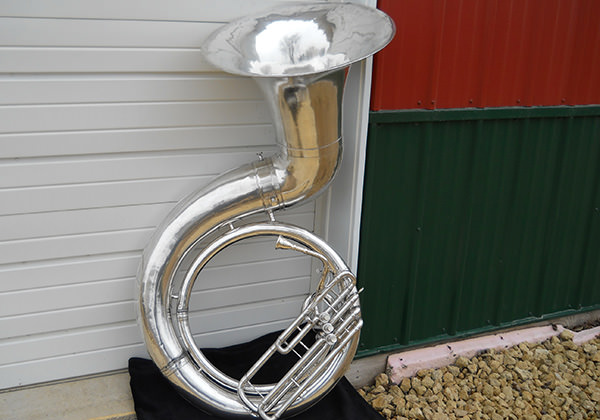 Over 70 years later, Richardson Fred Pfaff's J. W. Richardson model Holton Tuba after extensive restoration at Lee Stofer Music. Rare Holton 6/4 BBb from over 100 years ago, after extensive restoration, and a new reproduction bell. Lee Stofer Music is the North American importer for Rudolf Meinl hand-made Brass Instruments. 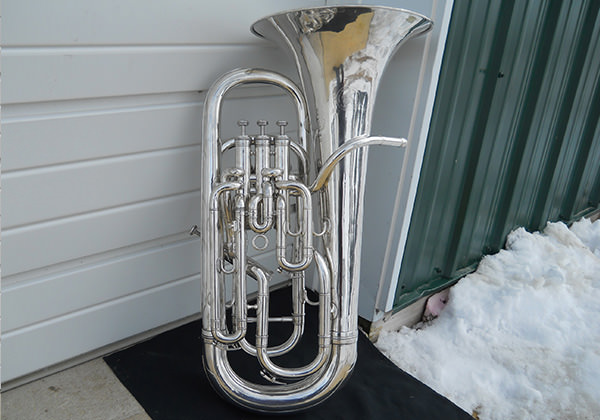 Boosey & Hawkes euphonium, refurbished and customized at Lee Stofer Music. 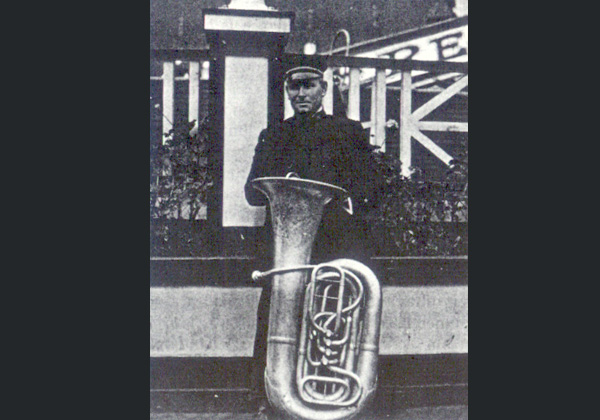 1906 Conn raincatcher sousaphone, refurbished and sold at Lee Stofer Music. Welcome to your Source for the new Stofer CC tubas, new Rudolf Meinl tubas, fine pre-owned instruments, as well as repairs, custom work and accessories. Located in Eastern Iowa, we are 150 miles due west of Chicago, near U.S. 30 (the Lincoln highway) and Interstate 80, and just minutes from the Quad-Cities International Airport. Since the business was founded in 1998, first working out of my garage in Atlanta, I am quite thankful for the many friends of Lee Stofer Music as the business enters it's 21st year. The repair shop is the primary part of this business, but sales remain important as well. I do the bulk of my work by appointment, which seems to work well. If your instrument needs servicing, please give me a call and we can set up a time for you to either bring it here or ship it, and we will get the work done while minimizing your time away from your instrument. If it is a routine servicing and you bring it in the morning, we can have it ready for pickup later the same day. A number of my customers bring the instrument here, then go sightseeing and return for their instrument the same day or the next, making it more like a short vacation. If you are looking for custom work, a play-condition restoration of an older instrument or a full restoration of an instrument, I am always happy to provide an estimate. 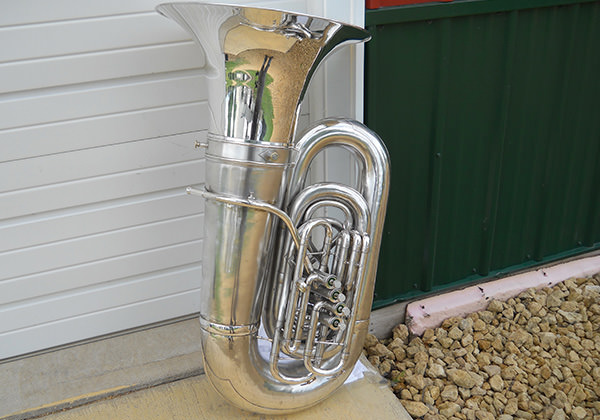 The completion and sale of the first Lee Stofer CC tuba in 2015 was a dream realized, but I felt that it would not be right to make restoration customers wait even longer while I built new instruments. So, most of 2015 and 2016 were devoted to working through the backlog of repairs and restorations, and putting the manufacture of new instruments on hold until customers' instruments were done. Meanwhile, Martin Wilk made a set of MAW pistons and fit them to the valveset for serial number 0002, Sherry Huntley of Artistic Engraving engraved the bell, and other preparations were made while restorations were going on here. Serial number 0002 started coming together in December 2016, and since I felt the need to show this instrument at the Capitol Tuba Conference at the beginning of February 2017, we worked some serious overtime in January to get it done. The resulting instrument is everything I ever wanted in a 4/4 CC tuba - an agile, responsive and in-tune instrument with a beautiful tone color, that is consistent from top to bottom of the range. The price is substantial, but so is the amount of labor involved in crafting such an instrument, with construction details that are hidden from view, and may be lacking in other instruments. In April of this year I completed the third Stofer CC, which is available for play-test and sale now. 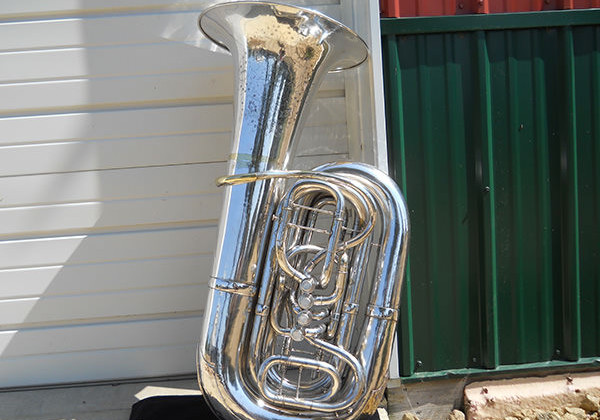 Please feel free to contact me to discuss the Stofer CC tuba, which is also easily convertible to BBb. Concerning sales of new and pre-owned instruments and accessories, I insist on having satisfied customers. All purchases have a seven-day approval period, and an extension if needed. If you are ultimately dissatisfied with your purchase in any way, return it and I will issue you a refund. I do request that the item be returned in substantially undamaged condition. Please feel free to call, e-mail or message me about your instrumental needs and wishes!